Progress and Plans at General Fusion talk by Michael Delage at the Fusion Power Associates annual meeting 2017: http://firefusionpower.org/Delage%20FPA%202017.pdf. https://nucleus.iaea.org/sites/fusionportal/Shared%20Documents/Enterprises/2018/Presentations/13.06/Plant.pdf. It is is good summary of where they are now. General Fusion has published a new paper. It is paywalled unless you have access through a university or research institute. With good confinement and relatively high beta (up to 40%), the spherical tokamak could be a suitable magnetized target. To illustrate this potential, the theoretical fusion yield from compressing a spherical tokamak adiabatically to fusion conditions is calculated. While it is found that the large amount of energy stored in the compressed toroidal field constrains the potential energy gain, a system can be designed to produce significant useful output by directly recovering a large fraction of the compression energy. With 80% energy recovery, an example system using 140 MJ of pressurized gas to compress the spherical tokamak plasma within a 2 m radius liquid metal flux conserver can produce a fusion yield of 140 MJ and a net output of 40 MJ per pulse. At ~ 1 Hz this would produce 40 MWelectric. General Fusion has published two recent talks on their home page. Results for the explosive compression test PCS 16 is published in Laberges talk. There is again a steady progress compared to the best previous result PCS 14. The demonstration plant under planning will be run on deuterium when they try to demonstrate fusion conditions, which will simply things very much and be cheaper. The curves of the number of private fusion ventures and the accumulated investments are also interesting. "The only company building demonstration plant to confirm capability to produce electricity from fusion"
"building" a demonstration plant. That is rather unambiguous. I know of no timeline details for the project, funding, location, but it looks like they are going for it based on their last presentation. According to your post mvanwink5, a bit more than a year ago, General Fusion announced then that they have started the planning work for the demonstration plant and that they will make the site decision in 2018. So maybe we will hear something about this before the end the year? Without a site, building is tough...unless we are loose with the term 'building,' in which case I am building a moon base, just not on the moon and I have only put one 1"x1" piece of wood in place. I would hope that GF is not engaging in loose terms. At a minimum, building should mean a site, plans for the site, purchasing of materials based on the plans, with some things undetermined that might be added later such as equipment to extract & process tritium. I saw a picture of a compression chamber with a couple of hundred small gas powered pistons, miniatures of their full scale pistons. Presumably they have been testing to prove their fluid dynamics simulations. I think they have gone to liquid lithium as opposed to liquid lead for their compression media. Must have a lead blanket outside the compression sphere? Dunno. harrydoughty1040Can you tell us a bit more about it? The porcupine quills on this design look a lot different than other photos that I have seen. 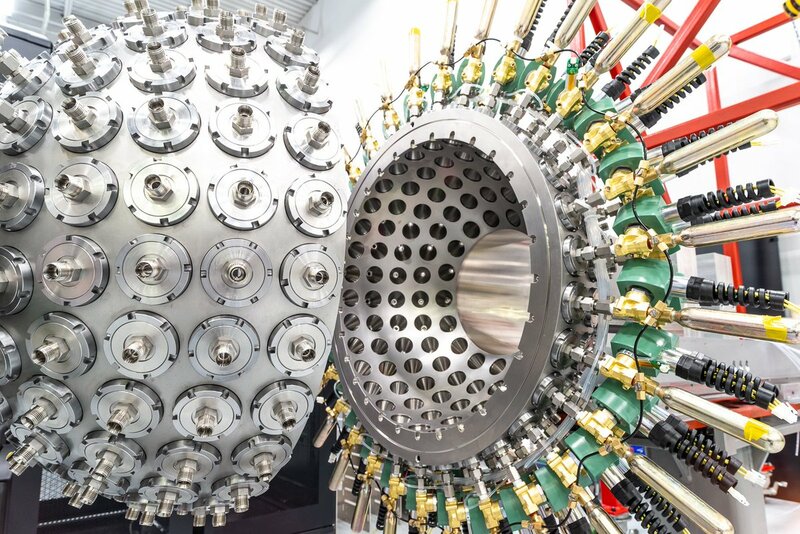 generalfusion@harrydoughty1040 this is a lab-scale testing device, so it uses jets of compressed gas for compression rather than the pistons you may have seen on our larger compression prototypes. The "quills" are the accumulators for the gas. We will still be using pistons on the full scale machine, but they are not necessary for the work being done on a smaller scale device such as this. jule.roy@generalfusion Do you have a rough date in mind about when the demonstration power plant would be operational and ready for demo? General Fusion will present at the next Annual Meeting of the Fusion Power Associates, so when the slides are published we should have an update on the new hardware and the other things they are doing. The Canadian government has granted General Fusion a $49.3-million investment. I can't understand why we go to such great lengths to make short comments, to fit a small box, yet to find information a wall of words has to be sifted to read one sentence that might say something...if only a couple of key words weren't left out. For instance, is that $150M 80% spent already developing their concept? Is $250M an old number or a new one? One earlier slide presentation says they are building the demo, this sentence implies they aren't. And it is always imponderable why '$49,317,823.17' and not a simple $50M? Further, are these Canadian dollars? One might think that. NBF has a followup interview, no interview quotes, just 'notes'. Nextbigfuture interviewed Christofer Mowry, the CEO of General Fusion. The highlights are that General Fusion is rapidly pushing ahead to achieve commercialization and the next step is to make a 70% scale pilot plant that will prove out the viability of generating electricity from General Fusion’s magnetized target nuclear fusion. General Fusion does not need to demonstrate fusion containment because they are pulsed power systems like a diesel engine or steampunk fusion. The Demo system will cost several hundred million dollars. General fusion is fundraising now. Several existing funders (Jeff Bezos, Canadian and Malaysian government) are likely participants in the next round. However, the fundraising cannot have actual disclosure until it is completed. As of late 2016, General Fusion had received over $100 million in funding from a global syndicate of investors and the Canadian Government’s Sustainable Development Technology Canada (SDTC) fund. They now have another C$49 million from the government of Canada. Over the five years of the demo plant, there will be design, construction and a nominal 18 months of testing. Titanium fabrication is with GE Additive as a partner. The current component for has 14 pistons and was not to achieve plasma compression but to work out other engineering issues. The demo system will have several hundred pistons. Perhaps around 500. The next system could have more or fewer pistons depending upon how experiments inform the design and how smoothly the plasma will need to be compressed. It will be deuterium fusion. The demo plant will not add tritium. Addition of tritium is a well-understood process and would have a predictable impact. Tritium will be added in the follow-up commercial system. My guess is that GF is waiting to see how much $ they can raise before designing the demo. It also looks like they are still uncertain on the compression design. I would guess that start date for the project s dependent on when funds are raised... it is a lot of cash. Nice details on the compression plans. Now they need the money to 'go ahead with a 10% Lawson criteria' build. I suppose that once they get that we will hear it, then maybe a project timeline. Looks promising to me.